Page 12 - Play Today | KaBOOM! We have long been proponents of the cardboard box. Not only is it cheap and 100% recyclable, but it opens the doors to all kinds of imaginative play. Signs like this make us sad. 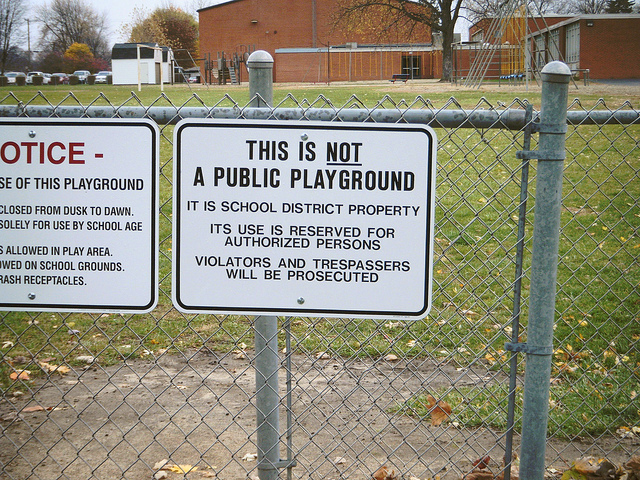 Why should a perfectly good playground sit unused? If there's a playground in your community that's all locked up, download our Joint Use Toolkit to learn how you can open it to the public after hours and on weekends. Photo by Matt Hutter. See our original Tumblr post about this photo. "If we don't let our children play, who will be the next Steve Jobs?" Last year our CEO & Founder Darell Hammond posed this question in his Huffington Post blog. Judging from the nearly 25,000 readers who shared the post via social media, clearly some other folks are wondering, too. Well, we just may have found him. Audri, the seven-year-old featured in this video, has built his very own "Monster Trap," similar in concept to the mouse trap in the popular board game of the same name -- except way cooler. As Dr. Alison Gopnik aptly noted in a recent presentation at our annual Play Academy, "The point of play is not getting the right answers, it's getting all the wrong answers." Audri seems to intuitively understand this, remarking of his contraption: "I think it will have 10 to 20 failures and two successes. That's my hypothesis." "There is a shift that takes place when your kids gain the skills to construct monumental forts that reach truly frightening heights. I’m not exactly sure what to do with their newfound ability to threaten their physical well-being." 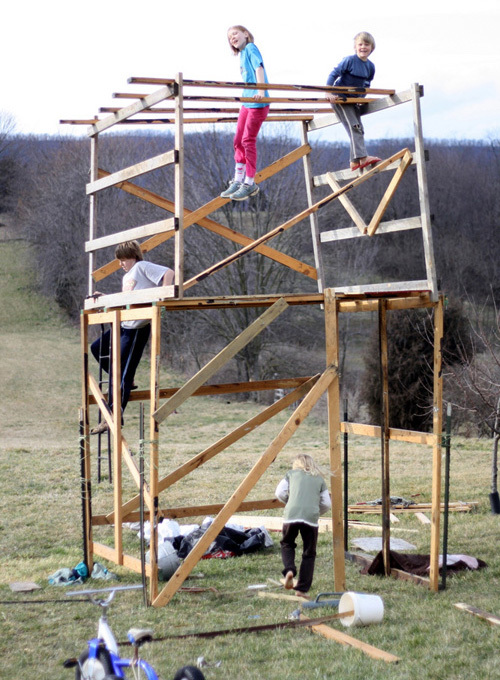 For more photos and the wonderful story behind this homemade jungle gym, including its eventual demise, read the full post, "rise and fall." I came across your website and blog via a link from our kids' school. They are raising money to build a new playground to replace the old playground. I'm worried because every single playground renovation in our town so far has taken a playground that was fun for lots of kids and replaced it with a boring, plain vanilla metal structure that is uninteresting for anyone older than seven. My kids are 10 and 11 and they are extremely upset that the really cool wooden structure is coming down, because "they're just going to replace it with another stupid tot lot" (their words). I would love to get involved with the playground renovation, but I refuse to donate money to an enterprise that is going to put up a boring metal structure. 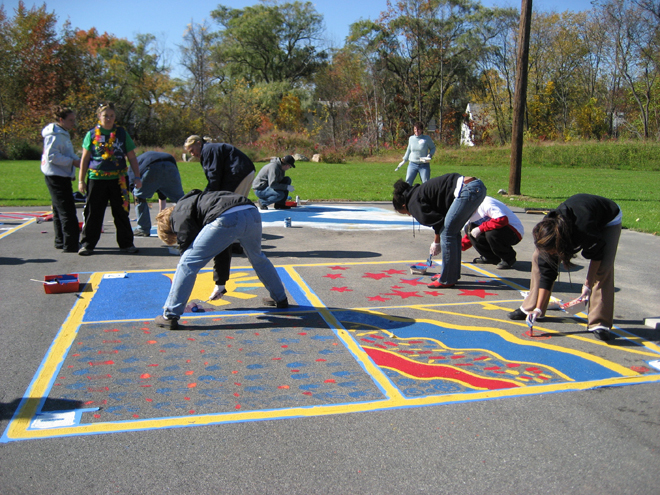 A different parents' group in town did this a few years ago -- raised money for a playground that was supposed to be designed for older kids. When it finally arrived, it was apparent that their idea of "older kids" was maybe five year olds. My kids went to the new playground (and they were about seven or eight at the time) and basically said, "That's it? What a rip off!" Do you have resources that one could point the committee to say, "This is a good structure for kids older than seven?" Also, is there any reason why the really awesome wooden playgrounds don't get built anymore? They're always the best, but they seem to be a rapidly vanishing species. When the really great one in the center of our town came down (mostly due to paranoid parents calling it dangerous because kids occasionally got splinters) my kids basically stopped going to playgrounds because there is nothing to do there -- "the structures are for babies!" I really want to fight this trend. What can I do? Do you have advice for Bridget? How much do parents need to play with their kids? Most mothers were sitting on benches around the perimeter watching their kids on trampolines, except for this one mom who had pulled a chair up close and was shouting, “Whee!” each time her child jumped. I knew she was American. Pamela Druckerman, author of the new book Bringing Up Bébé describes this scene on a Paris playground in a recent interview with Macleans. Amongst the many differences she notes between American and French parenting styles is the "belief in America that we must always stimulate our kids." 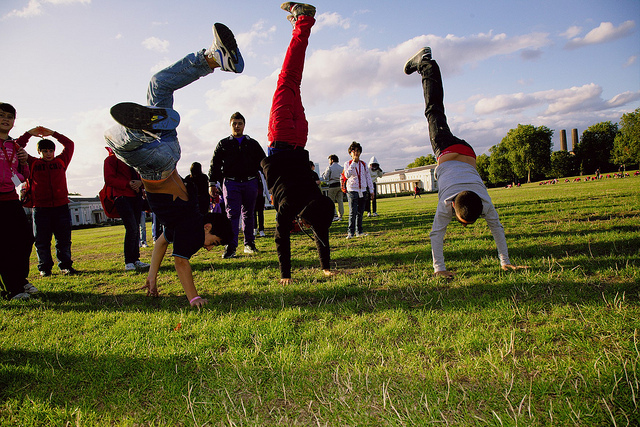 In France, by contrast, "children are given freedom to play by themselves, and to cope with frustration and boredom." ... when American parents come to my house, they’re constantly engaged with their children resolving spats, or getting down on the ﬂoor and playing Lego. We never finish a conversation, certainly not a cup of coffee. When French families come over, the kids go off and play by themselves and we adults have coffee. We've written before on this blog about the benefits of boredom and the importance of children engaging in free, unstructured play, without parental hovering. But is it a "bad" thing for parents to build Lego houses with their kids? Of course not. 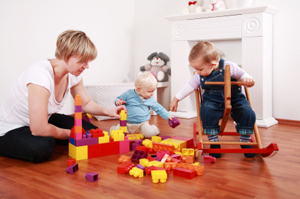 Perhaps the more relevant question is, should you as a parent feel obligated to build Lego houses? Would you rather be socializing with friends or catching up on household chores? Could American parents make things a little easier on themselves if they loosened the reigns and allowed themselves more "me" time? To the last question, Druckerman would respond with an emphatic yes. How would you respond? 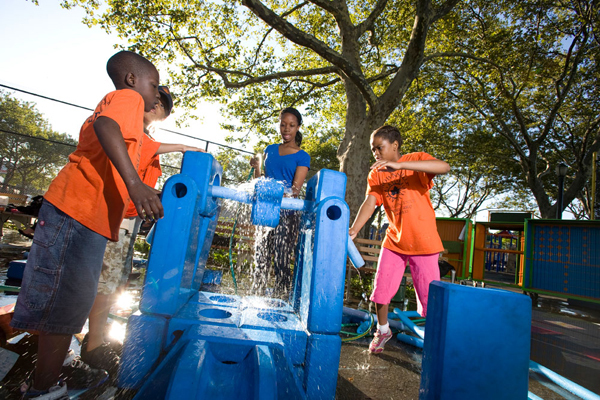 Playgrounds don’t improve themselves—they need love and care to thrive. 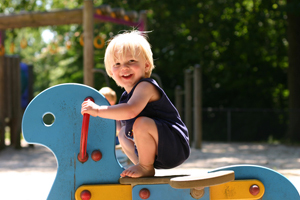 If you’re lucky enough to have a playground within walking distance of your home, here are seven ways to ensure that it stays safe, well-maintained, and most importantly, played on by young and old alike. In honor of St. Valentine, let’s show your playground some love. Are you sure new neighbors know where your playground is? Add photos to our Map of Play, and be sure to let folks know about its condition and the amentities it offers. If your playground is already on the map, you can help provide more information by adding your own comments and reviews. Imagination Playground™ in a Box or Cart is a semi-mobile kit of parts to encourage unstructured, child-directed play. A set includes a storage unit on wheels and Imagination Playground™ Blocks—loose parts that allow children to constantly reconfigure their environment and to design their own course of play. 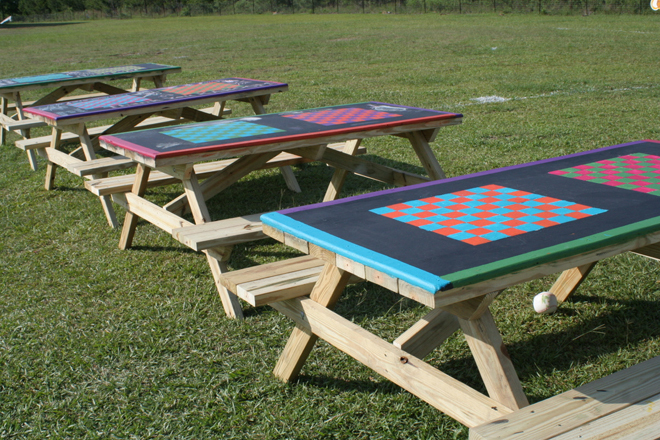 Instead of, or in addition to, Imagination Playground™, you can create a “PlayPod” for found and donated items ranging from fabrics to safety cones to cardboard boxes. 7. If it's broke, fix it!